More than 2000 pagesâ€”six novels from six New York Times and USA Today bestselling authors! Each book is the first in a beloved series. 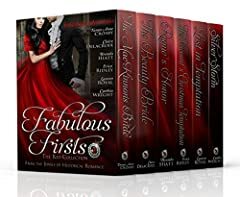 From the majesty of medieval castles to the glittering ballrooms of the Regency, read an enchanting novel from six of the twelve Jewels of Historical Romance! Scotland, 1421: Madeline flees her arranged marriage to the notorious outlaw Rhys FitzHenry, never expecting the taciturn warrior to pursue her and defend herâ€”much less steal her heart away. When Rhysâ€™ past threatens his future, will Madeline and her newfound love be enough to save him? London, 1815: Certain individuals might consider Lady Amelia Pembroke a managing sort of female, but truly, most people would be lost without her help. Why, the latest on-dit is that rakish Viscount Sheffield is canceling the fÃªte of the year because he hasn't time for silly soirees. He doesn't need timeâ€”he needs her! Also look for Fabulous Firsts: The Blue Collection by six more bestselling Jewels of Historical Romance!